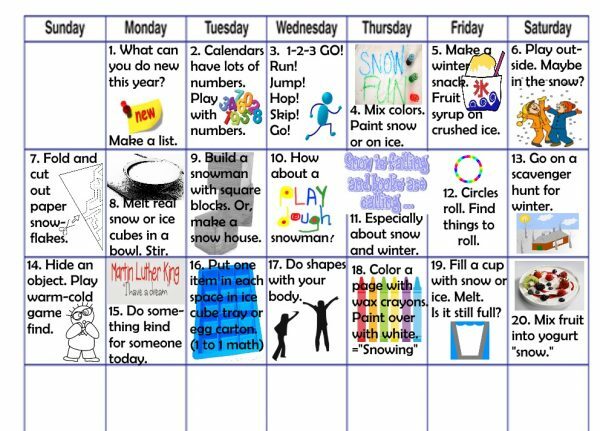 The calendar still says winter so here is another week of January winter play activities for kids. No matter if it’s warm or cold where you live, you and your kids can play the Warm or Cold Hide and Find game. Did you ever play this game? You can’t play it by yourself so find a family member or friend to play with you. It starts when one person hides an object. The other person takes a few steps in one direction. If it’s the right direction to find the hidden object the person who hid it says “Warmer.” If it’s the wrong way to go, the hider says “Colder,” and the person who is trying to find the object has to go a different way. The seeker keeps moving according to the warmer or colder clues given by the hider. This game can be played by two or more people of almost any age. Sometimes, the hider adds even more hints like, “Really warm” or “Burning hot.” This signals being very close. Once the object is found, players can switch giving someone else a turn to be the hider. This game can be played indoors on days when everyone is staying inside the house. On better weather days, play it outside. Enjoy the rest of theJanuary winter play activities for kids. There are many great New Year’s resolutions, but a priority is kids need time outdoors every day. Try for at least 10 or 15 minutes, depending on weather. While this doesn’t sound like very much, it’s more than the average! Research has discovered kids these days only spend 4 to 7 minutes a day outside. Compare that to about 4 hours of watching tv or other screens. 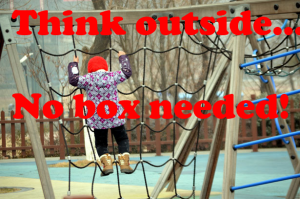 It’s almost unimaginable that we would need to make a new year’s resolution for kids to play outside. What a change in just one generation. 1. The Walk: Going for a walk is pretty obvious, but it’s surprising how different it can be from one day to the next. Of course, getting young kids dressed for the weather can take more time than the walk, but it helps if mitts, boots, mud pants, and other items are all together in a basket by the door. 2. Get a Kick Outside: Kicking a ball can happen on grass or snow. Maybe tuck an extra pair of socks in a pocket. Sometimes when kids kick the ball, they also kick off their boot. 3. Hunt for Treasure: In some areas, the ground could be covered with snow, but there will still be treasures. Check around trees and bushes for sticks, pine cones, and small stones. 4. Follow the Leader: This is a fun game for all ages. When kids lead the line instead of adults, they like to splash in puddles and slide on the ice. Be prepared. 5. I Spy: Look around and take turns playing I Spy. Even if there’s no snow, clouds are also white. 6. Colored Snow: Make a rainbow in the snow with some squirt bottles and colored water. This might need a few pairs of mittens as well as several bottles of different colors. 7. Playgrounds: Swings and slides can be fun even in the winter. You might need to take along an old towel or rag to wipe off the slide. If the area at the end of the slide is quite icy, you may be able to break the ice or scrape some dirt over it so kids don’t keep sliding when the get to the end of the slide. Are there ropes to climb too? 8. Hopscotch: While this is harder to do in boots, as long as the ground isn’t too wet, kids can play hopscotch. Just hopping around is fun too. 9. Tag: For kids that are a little older, they can choose a tag game like Frozen Tag or Statues. Running around and chasing each other is always fun. 10. 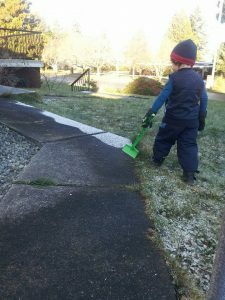 Shovel the Snow or Dig in the Dirt: A shovel is a fun toy for outside play. For kids that is. Kids need time outdoors and so do grownups but adults don’t think of shoveling snow as fun. Kids will have their own ideas of ways to play outside. Could Kids Need Time OUTDOORS Every Day be one of your family’s resolutions and goals? Usually we don’t have to encourage kids to move around and be active. 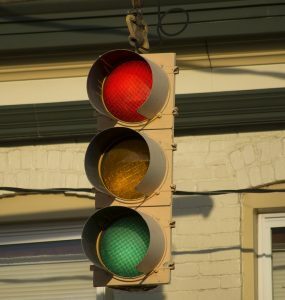 For both moving and stopping, kids can play a Red, Yellow, Green Light game. The rules of this game are very simple and easy to remember. They are like traffic lights. Red signals a stop, green means it’s okay to run around fast, and yellow is for going slow, just walking along. A big space like a backyard is great but it’s also possible to play this inside. Some houses have a hallway or other space where little kids can run but the green light time might need to be quite short. Young kids may need a parent, caregiver, or an older child to call the color of the lights. If kids are old enough, they can play this game independently with friends. One person gets to call the color of the light and the other kids either stop, walk, or run. 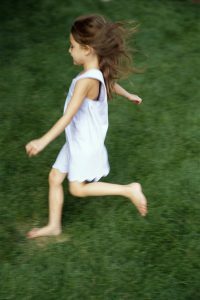 Movement activities for kids are absolutely essential. They optimize the development of brains, not just muscles. Through physical stimulation and movement, millions of connections for thinking form in the brain. This red, yellow, green light game adds another layer to play, combining movement and simple rules. Kids match their movement to the color of the traffic light. Even children that can barely talk know red lights mean stop and green means go. Kids can include sound effects as they play and make screechy brake noises when they hear, “Red Light.” The “Green Light” call invites them to rev their motors and change gears as they run around. And if somebody is too slow for “Yellow Light” it’s okay to honk a horn. Keep some small pieces of paper handy to write a speeding ticket for kids that go too fast and don’t watch out for others. Do you know what the traffic light said to the cars? “Don’t look. I’m changing.” Has your child played the red, yellow, green light game?